On February 22, the Japanese celebrate Cat Day, an informal holiday dedicated to one of the most popular domestic animals. 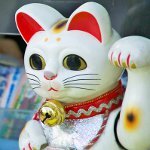 Although cats are popular all over the world, Japanese people seem to have a special fondness for them. Japan has one of the highest number of cats per capita in the world. There are special cat-themed cafes in Japan and even a whole island inhabited by cats in Fukuoka Prefecture. And the maneki-neko (beckoning cat) is a common Japanese talisman that is believed to bring good luck. No wonder the nation that loves cats so much has a special holiday dedicated to them. Cat Day in Japan is known alternatively as “Nyan Nyan Nyan Day”. “Nyan” is the Japanese equivalent of “meow”, the noise made by cats, and “ni” is the Japanese word for number two. February 22 (written 22/2) is pronounced “ni ni ni”, which apparently resembles “nyan nyan nyan”. Probably, that is why February 22 became a cat-themed holiday. The first written mention of the holiday dates back from 1987, although Cat Day had probably emerged much earlier. On the occasion, special events are held by pet shops, cat owners associations etc. Many people post photos and videos of their cats on the Internet to celebrate Cat Day.